The GeeKay Millennia has the best mix of amenities, features and conveniences for both business and leisure travelers. These and our top rated customer service ensures that you feel pampered when you stay at The GeeKay Millennia. The swimming pool at The GeeKay Millenniaa is very popular with our guests. Not only is swimming the ideal exercise to feel fit and refreshed, our guests also like to have some of the smaller and more casual business conversations by the pool side. 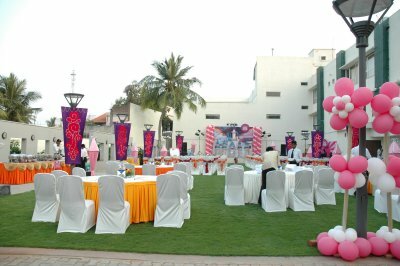 Beverages and refreshments served here to complement the mood and help take the conversations to a new level. Our Health Club aptly called FLAIR is the right destination for the fitness enthusiast. 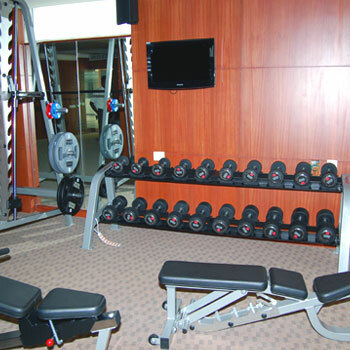 Guests who do not want to miss out on their daily regimen can enjoy working out on world class equipment, in a pleasant ambience. The quality and design of the equipment have been certified by fitness enthusiasts and are safe, convenient and fun to use. If the Health Club is good for your physical fitness, FLAIR, our Salon & Spa is the right place to make you feel good from deep within. You can avail the latest in cosmetic and wellness treatments including different kinds of massage. A personal masseur is available on appointment to ensure that extra level of care you may want. Soothing Ayurvedic massage is provided using a wide array of vegetable and herbal oils. The sauna and jacuzzi leave you feeling rejuvenated and complete the ensemble of experiences at The GeeKay Millenniaa. The GeeKay Millenniaa currently offers 48 rooms with the latest in style, comfort and convenience as preferred by business and leisure travelers of the world today. 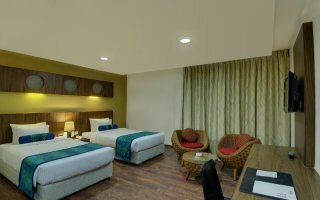 The rooms and suites are ergonomically designed, and come with pleasant décor and modern business aids to create an experience that you will relish. And all this comes at unbelievable prices adding the gilt edge to your experience. 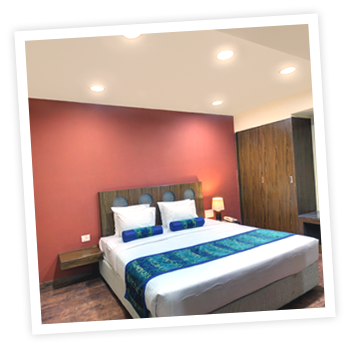 There are three grades of accommodation: Deluxe Room, Superior Room and Suites with added benefits as you move through the types. 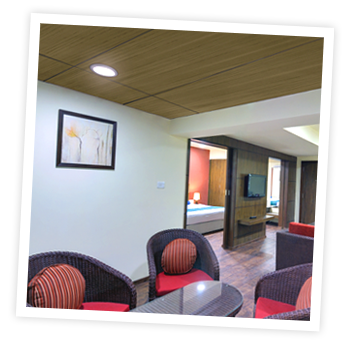 The Superior Room has all the features of Deluxe Room and more, while the suite combines features from both of them. Click here for Tariff Card. The GeeKay Millenniaa offers the best of food and beverage to accentuate your stay and experience at the hotel. SILVER SPOON is a restaurant that takes fine dining to the next level. The restaurant offers a mix of cuisines to suit travelers from around the world. Check in to the Silver Spoon to enjoy a leisurely breakfast, lunch or dinner. The coffee shop serves food and beverages around the clock, making it an excellent option for late night conversations around the table. THE FLUID BAR is a wonderful place to end your hectic day. Refresh yourself with your favorite drink while having a relaxed conversation with associates, or family. The Resto Bar is well stocked with premium brands from around the world, and offers exotic cocktails and mocktails to suit your mood and taste. 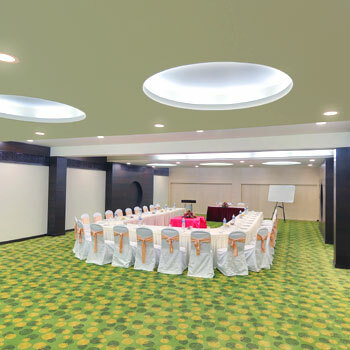 Business conferences or meetings have become both complex and sophisticated with a multitude of needs to be factored at every step. 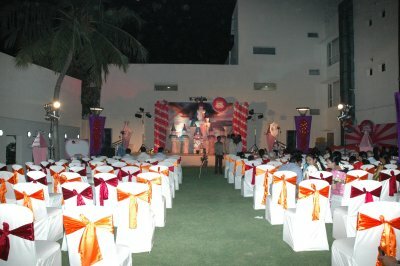 That is why; The GeeKay Millenniaa offers various options for audience capacity, seating style, entertainment and dining options. This creates a style statement for your brand, and breaks the monotony that business meetings have begun to be associated with. However, one thing is common in all these options: the latest in Information and Communication Technology equipment that we provide to ensure smooth and seamless conducting of your business meetings or events. Click here for Tariff Card. Vellore Bazaar is the ideal place to shop for local specialties such as leather goods, spices, flowers and flower oils, herbal medicines etc. Delhi Gate is a historical site on the banks of river Palar: The gate was part of a fort built by Mughal governor, Daud Khan Panni, in the first half of the 18th century. It was the site of a memorable defense made by Robert Clive during the Siege of Arcot (ref Wikipedia). Amirthi Zoological Park is a zoo spread across 25 hectares of land and situated 25 kms from Vellore city. The wildlife sanctuary contains various waterfalls and wildlife enthusiasts can spot deer, mongoose, hedgehog, foxes, reason monkeys, red headed parrots, love birds, tortoises, peacock, crocodiles, wild cats, eagles, ducks, pigeons, wild parrots, rabbits, and pythons. Vellore Fort Built by the Vijayanagara kings, the fort known for its grand ramparts, wide moat and robust masonry has been owned and managed by various dynasties in its long history such as the Vijayanagara kings, Bijapur Sultans, Marathas, Carnatic Nawabs and finally the British until India's independence in 1947. Sripuram Golden Temple: This is a spiritual park situated at the foot of a small range of green hills at the southern end of Vellore city and houses a Mahalakshmi temple. The temple is located on 100 acres of land and has been constructed by Vellore-based Sri Narayani Peedam, headed by spiritual leader Sri Sakthi Amma. VIT University aspire to establish a system of Quality Assurance, which would on a continuous basis evaluate and monitor the quality of education and training imparted at the Institute, improve the teaching-learning process and ultimately, develop the Institute as a Centre of Excellence. All Rights Reserved to GeeKay Millenniaa.